Every crib sold today, regardless of the retailer, must comply with these new regulations; all retailers are now required to sell only cribs that meet these safety standards. All Dream On Me cribs; toddler beds, cradles; Mattresses produced are all fully in compliant. A safe crib is one that has been purchased new, certified by the manufacturer as compliant with CPSC requirements through 3rd party testing and ASTM. Any used cribs that were produced prior to the release of the new crib safety regulations on June 28, 2011 may not meet these standards, and can prove to be dangerous to your child, especially due to improper storage and maintenance. Do not purchase second-hand or used cribs, since you may be unaware if the crib was properly assembled, handled and stored. Infants should ALWAYS sleep in a crib, which meets current Federal and ASTM standards. Pursuant to regulations promulgated in 2011, cribs with traditional drop-sides (traditional drop-sides mean sides that slide down rather than fold down) are not compliant with current Federal standards. Read and follow all instructions and warnings provided with the crib. If the instructions are not clear or parts are missing, call the manufacturer or retailer. You can contact Dream on Me @ 732-752-7220. Under no circumstances should substitute or makeshift hardware be used. When disassembling a crib for storage, retain all the parts and instructions. Store parts and instructions in a Ziploc bag and tape to the bottom of the crib. When reassembling a crib, be sure you have all the parts. Always send in the product registration card that comes with every new crib (we offer this service online as well). Returning the card ensures that the consumer will be notified if the crib is recalled. 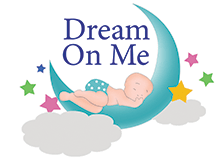 You can access Dream On Me registration card system here; by also checking the websites of the U.S. Consumer Product Safety Commission to see if your crib has been recalled. Check the crib often for missing hardware, loose screws or anything out of the ordinary. A consumer could even make it part of the routine to inspect the crib every time the sheet is changed, which Dream On Me recommends. The mattress size should be at least 27 1/4“x 51 5/8”, and should not be more than 6 inches thick. The mattress should be of such length and width that the gap between the mattress and the sides of the crib is not more than 1-3/16 inches when the mattress is pushed into the corner of a full size crib. Adjustable mattress height: Most cribs let you change the height of the crib mattress by simply raising or lowering the mattress support. The time to lower the mattress is when your child begins sitting up. As kids get more active and move to pulling up and standing, you don’t want them to climb or fall out of the crib.